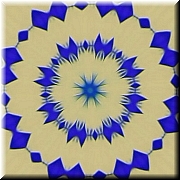 DIGITAL ARTWORK. Light tan "leather" with scalloped stripes or ribbons in cream, pale coral, and pale indigo. 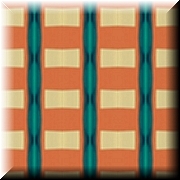 A very Southwestern look in soft neutral turns---perfect to use as background tile at a website or on your desktop! (For tiles, I find that the smaller sizes work best, but feel free to try them all). DIGITAL ARTWORK. Simple and elegant: a dark blue "sun" engraved on a background of khaki-colored "leather." 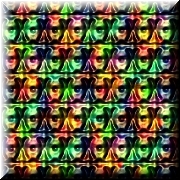 A very high impact design to use as digital tile at your website or on your desktop. 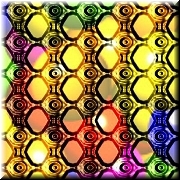 I recomend the smaller sizes for "tiles" but feel free to try them all! DIGITAL ARTWORK. 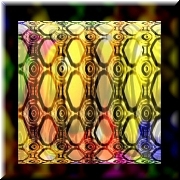 Two images of yellow cut glass, with additional tints: orange, blue, rose, and purple. The first has a dark background with intimations of the same colors in it. these are two of my favorites; both make gorgeous tiled backgrounds, even in the larger sizes. I'm extremely fond of the "floating box" version since I like a dark background and it produces an unusual, gemmed effect. Brilliant colors. DIGITAL ARTWORK. 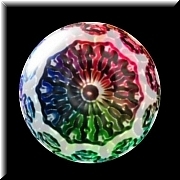 A translucent glass bead with a carved flower image in alternating shades of midnight blue, teal, dark green, and burgundy. The background is glossy black. This is a lovely ""3D" image with a jewel like appearance. 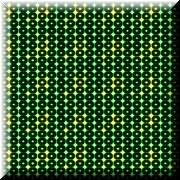 It makes a gorgeous tiled background in all sizes. 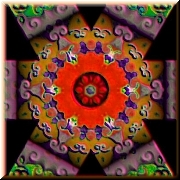 DIGITAL ARTWORK. 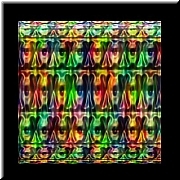 Multi-colored textured stained "glass" on black background; the same image full-sized. Another favorite: I used the "floating box" on black as the background for the main page of my website. It's a great offset for text on a dark background and creates a very rich, dense effect with a jewelled texture. Particularly for the full-sized image I probably recommend the smaller sizes for tiled backgrounds or desktops. The colors in the image include rose, lavender, light green, emerald green, blue, apricot, orange, and touches of aqua and lemon yellow. DIGITAL CROSS. 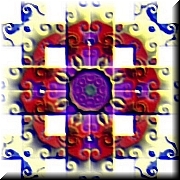 "Fading" purple cross---a true "advent" purple"----with a circular center surrounded by rays. In the center of the cross is a small center stone in teal. The cross is superimposed on a rim of deep crimson into which it seems to be fading. The rim has rococco details (curlicues and scalloping). The tile is a very pure white, with blue designs in each corner. Unusual design; striking colors.